Water Floats, Many Colors, Perfect for Yachts! 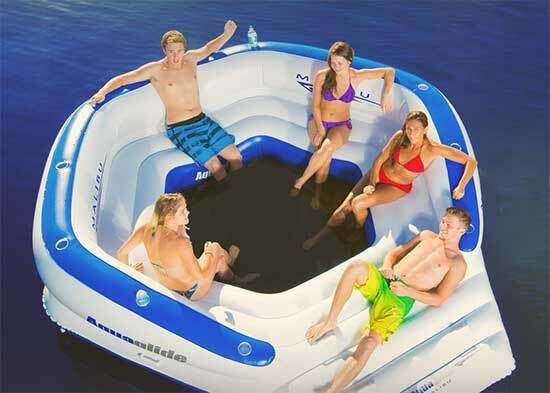 Brownie's Yacht Toys offers Ultra Sunsation Pool Floats. Looking for the float that supports everyone? Full thickness, everlasting quality and generous support, the Ultra Sunsation® has it all! Two and a half inches of full foam buoyancy! Bright, beautiful colors of glossy, antibacterial, fade resistant vinyl! Soft and Durable! Made in the USA. See color list below. Contact Us and we can answer your questions. Approximate Flat Dimensions- 72" x 26" x 2.5"
Contact Us about Ultra Sunsation Pool Floats. The Malibu Lounge was born to party! With generous seating, comfy backrest, cool soaker-mesh floor and copious cup holders, this lounge means business. Generously sized for up to 10 users, the Malibu Lounge sports an integrated boarding platform with molded handles for easy access from the water. Brief: Extra-large party lounge platform with backrest. 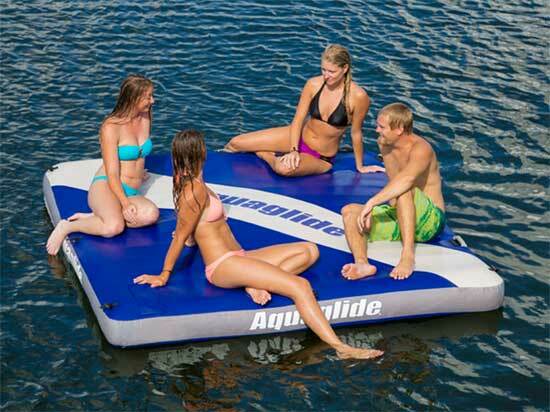 Contact Us about Malibu Lounge Floats. The Airport Classic balances performance, style and value in a remarkably versatile swim platform so that you and your guests can play on the water with style. Ideal as a lounge, swim raft or launch pad for any watersport, the Airport can also be towed with up to three people. Designed primarily for residential use, the classic styling fits comfortably in any waterfront environment. The Airport Classic features reinforced handles for boarding, towing and transport. Contact Us about Airport Classic Floats.